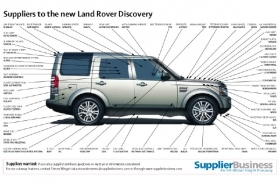 Numerous suppliers contribute to the fourth-generation Land Rover Discovery's powertrain. Germany's ZF Friedrichshafen AG provides the premium SUV's automatic and manual transmissions. Meanwhile, Magna Powertrain, a unit of Canadian-Austrian parts group Magna International Inc., supplies the integrated transfer case. The electro-mechanically actuated transfer case improves torque transfer and traction in all conditions, thereby improving off-road capabilities. Dana Corp. provides its high-performance front and rear axles. According to the U.S. supplier, its design offers best-in-class noise, vibration and harshness (NVH) refinements. The axles come from Dana's plant in Birmingham, England. U.S. supplier Gentex Corp. provides the new Discovery with auto-dimming mirrors that can be fitted with optional Automatic High-Beam Assist functionality. The system is designed to dim the headlights to prevent them from temporarily blinding other drivers. The technology detects oncoming traffic using a camera integrated into the mirror. Software then processes the image data to decide whether the high beams should be deactivated. Land Rover unveiled the face-lifted Discovery, alongside its face-lifted Range Rover, at the 2009 New York auto show.